Our long haired range of faux fur cushion covers is a collection of pure luxury and style. Usually made with a dense undercoat and added long fibres, the long haired faux fur fabrics are close representations of real fur in many instances. We have both bright coloured fur cushions and more subtle greys and browns. There are pastels, with the addition of our Baby Blue and Candyfloss faux fur designs, or plain black, brown, or white pillows. All of our faux fur cushion covers create real design statements wherever they are used; either on a bed a sofa or chair. A cost effective way of adding accents and texture to a design scheme without breaking the bank. A beautiful baby blue colour, our Baby Blue faux fur cushions are made from a long, dense, fur, plain but soft and warm. Ideal for pale colour schemes and bedrooms. Lustrous black long haired faux fur; these plain black faux fur cushions and cushion covers ooze quality and style. A rich brown luxurious faux fur is used to make these faux fur cushions and covers. Plain, long haired, dense and soft. Superb quality at a great price. A beautiful baby salmony pink colour, our Candyfloss faux fur cushion covers and cushions are made from a long, dense, fur, plain but soft and warm. Ideal for pale colour schemes and bedrooms. Slightly off-white, long haired, plain faux fur cushions and cushion covers. Zipped along one edge and available in 2 standard sizes and a choice of backing. 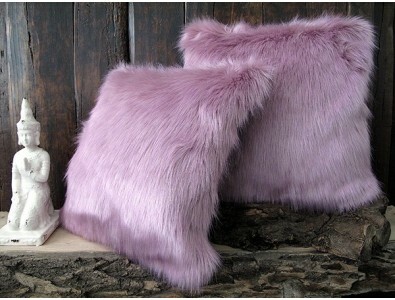 This faux fur cushion design is beautiful lilac colour, with a hint of pink. our Foxglove fur cushions are made from a long, dense, fur, plain but soft and warm. Ideal for pale colour schemes and bedrooms. A striking grey faux fur is used for these Grey Squirrel faux fur cushions, interspersed with long black hairs. A dense and warm undercoat. This fur makes a real design statement and will fit into almost any room. Luxurious long fur.